You all already know that I love my dear friend Bari J. 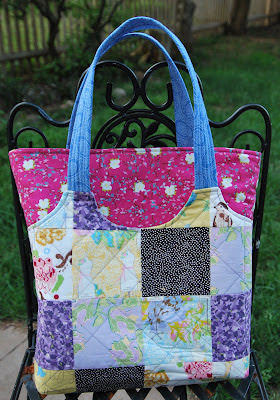 And you know that I am a huge fan of her patterns, and her "Keeping it Real" sewing philosophy. Well, when I saw that Jeni from In Color Order did a review of Bari's State Street Tote pattern, and how AMAZINGLY gorgeous it came out, I had to make one of my own. The first thing I will say, is that the pattern cover was deceiving to me. This tote is much larger than I expected it to be. I hadn't made one because I thought it would be smaller, and well, I tend to carry a lot of junk around. The size of the bag is fantastic. It works out to be about 14" square and the handles are JUST the right length to put it over your shoulder (to distribute the weight of all that junk). 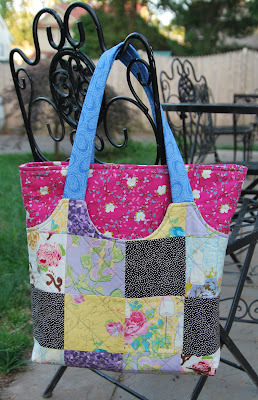 I used fabrics from three of Bari's lines of fabric. Some of my precious Full Bloom (the pink for the interior section", some of my Art Gallery, with the script writing, that I've been hoarding for just the right spot, and some Paris Apartment. Do you believe that three of her lines go this well together?? The interior is so roomy, and has a great divided pocket. Another thing I didn't realize from the cover photo of the pattern is that BOTH of the sides are actually pockets too! When you see it from the top, there is SO much room, and it's so sensibly constructed that you can use every little bit of room without your junk sliding around. Pure genius I say. As always, Bari's directions were fantastic. Her detailed images that are used to show more difficult directions really make things clear. It took me around 3 1/2 hours total to make this bag. A time bargain! 1. Precise pressing is really a big differentiator when you're making bags. Just like sewing, my pressing has improved greatly over time. I could really tell a difference with this bag how much neater everything came out and how smoothly things went together because of good pressing. 2. Lots of layers makes for even more difficult lining-up. I worked like crazy to get my side seams to line up. When I flipped the bag right side out I was not satisfied with how one of the sides came out. Your ideas and thoughts are welcome. 3. It's really important to have your lining/fleece cut as precisely as your fabric pieces. One of my sides was exact, the other side, my fleece was a little wonky, and it made for a tougher go of lining things up (see point number 2!). Now go get yourself this pattern, and make one of these totes! You can buy the pattern here in Bari's online shop, and at many other online fabric stores.